Scientific investigations show, that energy resources like oil and natural gas, will be used up in far less than one century, if energy consumption will be held steady. Coal reserves will stand by for another two centuries. The world’s energy demand will increase strongly, if emergent countries try to reach the standard of living of the western countries. Contemporaneously , it can not be expected that industrial nations will reduce their consumption dramatically. 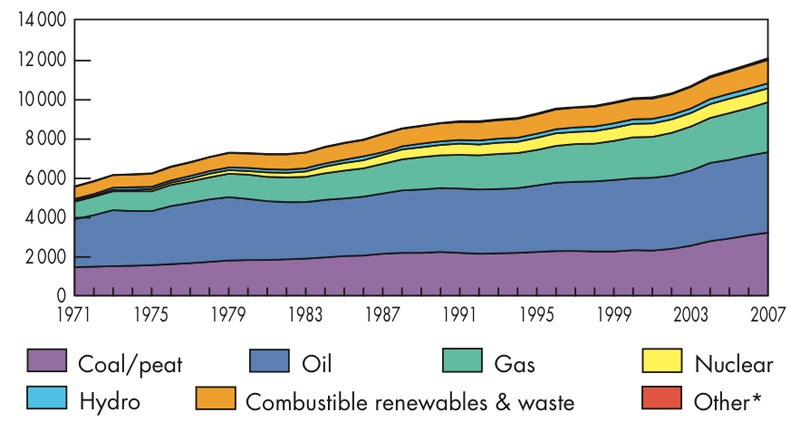 Just in the time span from 1970 to 2000 the primary energy consumption almost doubled. A similar or even stronger growing development can not be combined with the fact that fossil energies are unlasting and ecologically critical. No mater when fossil energy sources will be exhausted, energy prices will raise. Even in the present, fossil energies can only be mined with more cost-intensive techniques than in the past. The uneven distribution and consumption of fossil energies leads to social tensions and political conflicts already today, which may grow stronger or even escalate. In many regions of the world, these conflicts also come along with a severe, life threatening water shortage. Only rational energy use can help to solve these problems. The potential to avoid the global energy crisis are known and can be used with known techniques. The origin of renewable and inexhaustible energy sources on our planet is the sun.